Now that we have finally seen some snowflakes this winter, hitting the slopes is tempting. Skiers, snowboarders, ice-skaters and others are slipping on their coats and enjoying the season. 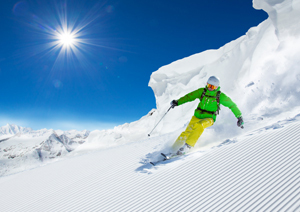 According to the American Academy of Orthopedic Surgeons, as many as 290,000 injuries related to winter sports occurred in 2014. If you are planning an outdoor activity this winter, we have some winter sports safety tips to follow. While sprains, dislocations and fractures are common winter sports injuries, over-exertion is also on the list of top injuries. By setting appropriate time limits, you can avoid over-exertion and possible frost-bite. Even when time limits are in place, it is important to stop immediately when you begin to feel tired or experience pain. Continuing to perform activities after an injury can make it worse and harder to recover. There is no way to fully prevent an injury outdoors. The next best thing is to plan in case of an injury. This includes going with a partner and informing others of where you plan to be and for how long you plan to be there. In order to stay warm – and cool, dress in several layers. Appropriate gear means both for your activity and your skill level. Beginners should wear additional safety gear such as knee pads, as well as the traditional gear like goggles and ski boots. Be sure to inspect your equipment for any safety concerns each time before heading out. Try to stay active during the off-season and in the months before. Training your body on a regular basis prepares it for seasonal activities. Warm up before going out just like any other workout. Keep hydrated before, during and after your winter sport activity. Keep water on hand in an insulated bottle if possible. Just as in workplace injuries, injuries from winter sports can occur from a person trying not to fall. Learning to let your body fall is easier said than done, but can actually reduce your chances of injury in some cases. Pro athletes make it look easy, but even the most gifted winter Olympians have undergone training. Most winter resorts and skating rinks offer beginner lessons for all ages. Even if you have experience with your sport or activity, taking a refresher course is a great idea. Never risk going out in dangerous conditions. High wind speeds and below zero temperatures can be deadly. If you are planning on going to a mountainous region, be sure to check the risk of an avalanche in the area. Never go on a trail or perform a move outside your skill level. It may be cold outside, but sun damage can still occur, especially with rays reflected from ice and snow. While most of your skin will be covered due to the freezing temperatures, be sure to protect the areas that will be exposed with sunscreen.